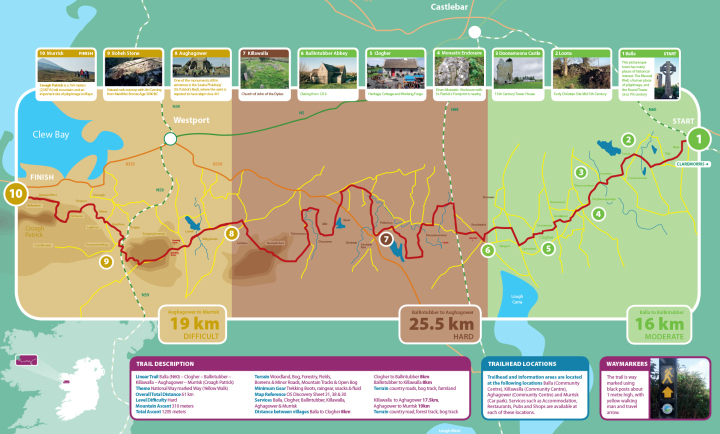 The Croagh Patrick Heritage Trail extends from the town of Balla westwards to Croagh Patrick. From Balla it passes through fields, boreens, minor roads and small sections of deciduous woodland and scrub en route to Ballintubber. From here the terrain includes tracks through bog and forestry and short sections through fields, boreens and minor roads to reach the village of Killawalla. If you are looking for a good opportunity to do this trail, the 9th Annual Croagh Patrick Heritage Trail Walking Festival on Weekend March 10th, 11th & 12th 2017. All funds raised will go towards Mayo Roscommon Hospice. Mayo Roscommon Hospice Foundation is a voluntary charity organisation that was set up in 1992 to provide specialist Palliative Care Services free of charge to the people of Mayo and Roscommon.